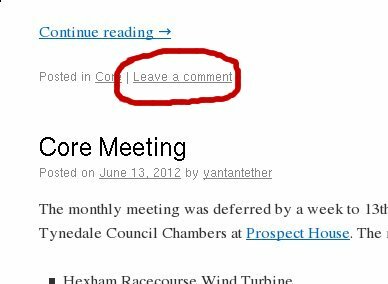 Its easy to post a comment and posting comments is what makes a blog dymanic and interesting so USE the blog. Just click on “Leave a comment” at the bottom of any post (circled in red on the picture). If this is your first comment fill in your email and name (no need to fill in the website field). Type in your comment and select if you want to to be notified by email of any follow on posts or to receive emails for posts and comments. Then press “post comment”. If this is your first comment then it will have to be approved by a moderator and so will not appear for a while. Comments after your first one will appear immediately. (On your second post if you cannot type your comment then just highlight your email address and left click and the text entry prompt will appear. At the bottom of the blog is an RSS feed icon if you wish to follow the blog using a news reader. Next ›What is your vision for sustainable Hexham? I’ll to say something interesting tomorrow and David will post it !